Balmoral Announces Agreement to Sel… | Balmoral Resources Ltd.
(Vancouver, October 10, 2018) Balmoral Resources Ltd. (“Balmoral” or the “Company”) (TSX: BAR; OTCQX: BALMF) announced today that it has entered into a letter agreement to sell the 1% Net Smelter Returns royalty (the “Royalty”) that the Company currently holds on the Fenelon Mine Property in Quebec. 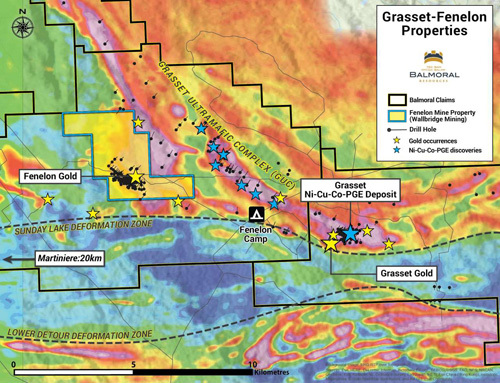 Balmoral will sell its rights and interests in the Royalty to Ely Gold Royalties Inc. (“Ely Gold”; TSX-V:ELY; OTCQB:ELYGF) in exchange for an immediate cash payment of $500,000, as well as 1,000,000 common shares of Ely Gold and 1,000,000 common share purchase warrants of Ely Gold. For Balmoral shareholders the Fenelon royalty sale provides a non-dilutive cash infusion that exceeds the currently estimated value of the Royalty, based on the published resource/reserve data for the Discovery Gold Zone on the Fenelon Mine Property. Balmoral continues to enjoy exposure to the Fenelon Mine Property through the Company’s share ownership in Wallbridge Mining Company Limited (“Wallbridge”) the current holder and operator of the Fenelon Mine Property, the shares/warrants to be acquired in Ely Gold and through its 100% ownership of a land position which surrounds the Fenelon Mine Property (see Figure 1). As well, the Company gains exposure to the portfolio of mainly Nevada-focused, gold royalty and property interests held by Ely Gold. The common shares of Ely Gold to be issued under the agreement will be subject to a standard 4 month regulatory hold period from date of closing. Each common share purchase warrant will be exercisable for conversion into one full common share of Ely Gold at a price of $0.10 for a period of 18 months from closing. The announced sale remains subject to completion of a formal Purchase and Assignment Agreement between the parties, the approval of the TSXV with respect to the issuance of the Ely Gold commons shares and common share purchase warrants, and the approval of Wallbridge to the transfer of the royalty to Ely Gold. Wallbridge does not have a right of first refusal as it concerns the transfer and sale of the Royalty. Mr. Darin Wagner (P.Geo. B.C. and Restricted Permit, Que. ), President and CEO of the Company, is the non-independent qualified person for the technical disclosure contained in this news release. This press release contains forward-looking statements and forward-looking information (collectively, “forward looking statements”) within the meaning of applicable Canadian and United States securities laws. All statements, other than statements of historical fact, included herein, including statements regarding the current estimated value of the Royalty, closing date of the agreement, the approval of TSXV and Wallbridge with respect to the proposed transaction, the receipt and timing of certain payments and the ability of the Company to realize value from certain share and warrant holdings are forward-looking statements. Forward-looking statements are typically identified by words such as: believes, expects, anticipates, intends, estimate, postulate and similar expressions or are those which, by their nature, refer to future events. Although the Company believes that such statements are reasonable, there can be no assurance that such statements will prove to be accurate, and actual results and future events could differ materially from those anticipated in such statements. The Company cautions investors that any forward-looking statements by the Company are not guarantees of future performance, and that actual results may differ materially from those in forward-looking statements. Important factors that could cause actual events and results to differ materially from the Company’s expectations include those related to performance of the project operators, undisclosed material information related to the project, the price of gold, the realized value of gold sales from the property, the costs used to calculate the value of the royalty interest, fuel and other mining and transportation costs, future exploration and development results from the property discussed, the profitability of the mining operations, the financial stability of the other companies mentioned and the market fluctuations in prices for securities of exploration and mining stage companies. Trading in the securities of the Company should be considered highly speculative.All of the Company’s public disclosure filings may be accessed via www.sedar.com and readers are urged to review these materials, including the latest technical reports filed with respect to the Company’s mineral properties.